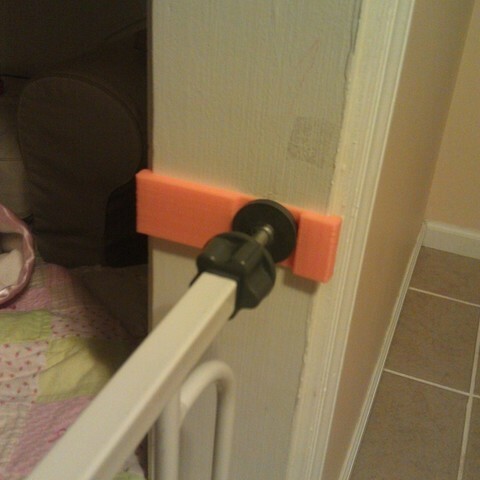 This support replaces a cup shaped piece that is supposed to be screwed to the wall for a Regalo Baby Step baby gate. We never installed those pieces for our first child as she wasn't really the type to explore destructively. Second one seems to take after me a little bit more in that respect, so the reinforcement piece is needed. If you happen to have the exact same gate mounted to the exact same opening, you might be able to use this stl file. I think the concept is good though, so its worth taking a few minutes to CAD up for your gate (or rescale the stl). This is designed to be printed on a 0.4mm nozzle with 1 extra shell. The thin spot that the gate presses against is 1.6mm wide. I printed it with 20% infill and 1mm top and bottom in PLA.